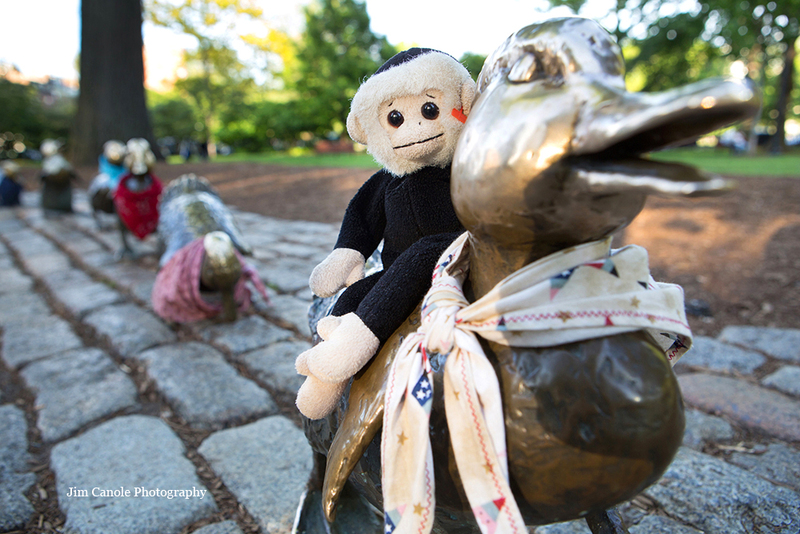 After enjoying the Beacon Hill Art Walk on Sunday, I walked through the Public Garden. As usual, there was plenty of activity around the Make Way For Ducklings statues. Here’s an image of Mooch getting into the fun. Mooch was visiting Boston with longtime fellow traveler, Cristina from Philadephia. Cristina elaborated on some of Mooch’s travel adventures saying, “In 2002, he was in Bulgaria and walking down the street when some Bulgarians stopped and propositioned me for him. They really wanted him and were willing to pay, but that was not going to happen. In 2009, he was in Los Angeles on the set of the TV show CHUCK and got to take some great pictures with the cast members. Just last month, Mooch was in Peru and, as usual in his foreign travels, he transcended language barriers and brought smiles and laughs to some of the local Peruvians who spoke predominantly Quechua. Mooch truly has a gift for winning over the hearts of adults, as well as children!” Many happy travels to you and Cristina, Mooch!